Not as Bad as It Seems. As we close out the old year and start the new one, it is a good time to get look at where we are. Most of us tend to think the world is pretty bad shape. Maybe it’s not as bad as we perceive. 200 years ago 40%of all children died before the age of five. People didn’t have a chance to be literate or to read books, average life spans were less than 40 years. And so in a span of not to much time, even compared to human history, we have made unbelievable progress; the things we take for granted, the abilty to go out and learn things, to have air conditioning, tove clothing, to have a toilet is pretty phenomenal. So anyone who looks at capitalism and what it does and says, “Okay it’s been a net loss versus that life we had before.” I think there is a loss of perspective there. Yeah, Its all about perspective. There ISIS in Syria and Iraq, Tribal warfare in Africa, Yet things seem to be getting better, Our wars for the most part less deadly. We watch news eith its 24 hour cycle and we see war and the horrors of war, and the world seems to be comming apart at the seems. But is it as bad as it seems? Judging the world through headlines is like judging a city by spending a night in A&E – you only see the worst problems. This may have felt like the year of Ebola and Isil but in fact, objectively, 2014 has probably been the best year in history. Take war, for example – our lives now are more peaceful than at any time known to the human species. Archaeologists believe that 15 per cent of early mankind met a violent death, a ratio not even matched by the last two world wars. Since they ended, wars have become rarer and less deadly. More British soldiers died on the first day of the Battle of the Somme than in every post-1945 conflict put together. We face heathcare upheaval, Ebola killing thousands. Our food is supposedly loaded with pesticides, herbacides and hormones. Genetically modified is gonna kill all of us who can’t afford to pay 4 times as much for Wholefood groceries. It’s doom and gloom and we are all gonna die. Would you believe that we actually aren’t doing that bad? This helps explain why Bob Geldof’s latest Band Aid single now sounds so cringingly out-of-date. Africans certainly do know it’s Christmas – a Nigerian child is almost twice as likely to mark the occasion by attending church than a British one. The Ebola crisis has led to 7,000 deaths, each one a tragedy. But far more lives have been saved by the progress against malaria, HIV and diarrhoea. The World Bank’s rate of extreme poverty (those living on less than $1.25 a day) has more than halved since 1990, mainly thanks to China – where economic growth and the assault on poverty are being unwittingly supported by any parent who put a plastic toy under the tree yesterday. Britons don’t need to look abroad for signs of progress. The Lancet report showed that, since 1990, life expectancy in Western Europe is up by five years – thanks, mainly, to fewer deaths from cancer and heart disease. The 24 Hour news cycle brings attention to the violent world that we live in. According to statistics perhaps there is something to entering the golden age of Aquarious. To be sure, adding up corpses and comparing the tallies across different times and places can seem callous, as if it minimized the tragedy of the victims in less violent decades and regions. But a quantitative mindset is in fact the morally enlightened one. It treats every human life as having equal value, rather than privileging the people who are closest to us or most photogenic. And it holds out the hope that we might identify the causes of violence and thereby implement the measures that are most likely to reduce it. Let’s examine the major categories in turn. Homicide. Worldwide, about five to 10 times as many people die in police-blotter homicides as die in wars. 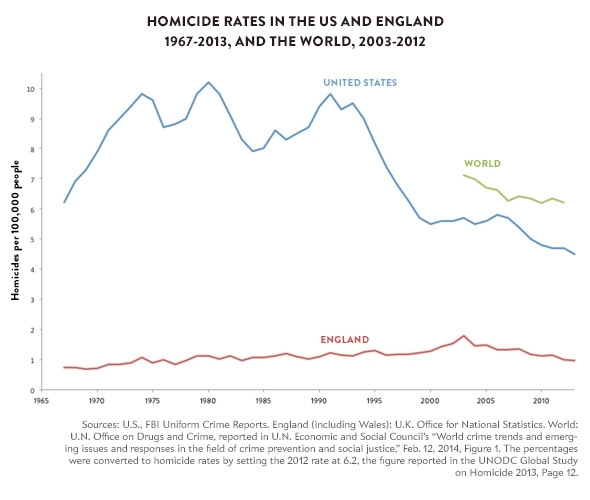 And in most of the world, the rate of homicide has been sinking. The Great American Crime Decline of the 1990s, which flattened out at the start of the new century, resumed in 2006, and, defying the conventional wisdom that hard times lead to violence, proceeded right through the recession of 2008 and up to the present. Previous PostDemonstration In BrocktonNext PostOrdering French Fries.